An update to my Mom's Bindaeduk, mung bean pancake recipe. This an easy recipe to modify to your taste. 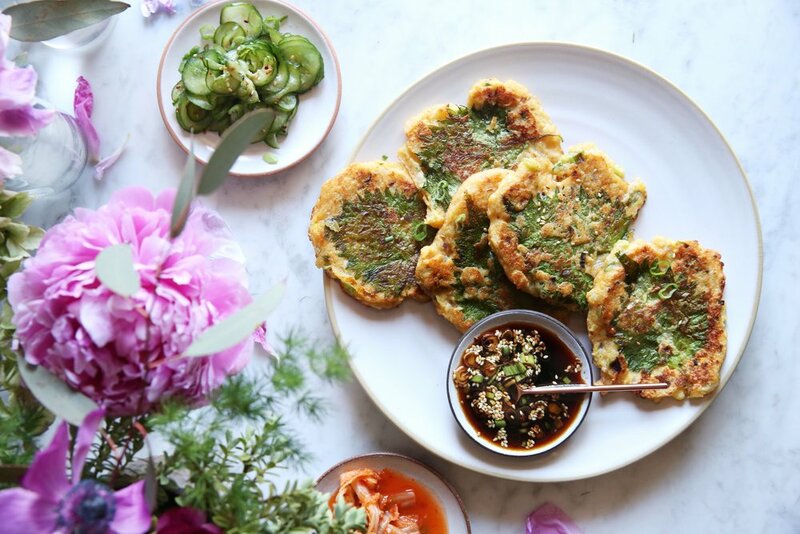 I added ramps because they are in season and the addition of a Korean perilla leaf to each pancake gives it a fresh grassy flavor and a pretty presentation. But to simplify the steps, chop the perilla leaf and add it to the batter. When in doubt, always add more kimchi! For meal prep, make extra batter and make them fresh easy day. It will keep for a couple of days. Wash mung beans and rice in a colander until water runs clear. Transfer drained mung beans and rice into a bowl and fill with filtered water until just covered, soak overnight in the fridge. In a large bowl season pork with ½ teaspoon salt, set aside. In the bowl of a food processor add drained mung beans, rice, garlic, broth and 1 teaspoon salt. Pulse until slightly smooth but leaving some texture. Transfer to large bowl with pork, fold in kimchi, kimchi liquid, onion, scallions and ramps. In a large nonstick pan over medium-high heat, add drizzle of oil. Add large spoonful of batter and spread into a thin 3-inch diameter pancake. Fry until golden brown on the bottom, place and press perilla leaf on top and flip; fry again until golden. Make pancakes in batches and add oil as needed. If batter is too thick, add splash of broth or water. Transfer pancakes to a plate. Combine all sauce ingredients with 1 tablespoon water in a small bowl and serve with warm pancakes. Trim chicken of excess fat. If the chicken breasts are large, cut in half for even roasting. Pat dry thoroughly with paper towels. Place chicken in a large baking dish or rimmed sheet pan. Drizzle olive oil over chicken, sprinkle black garlic salt, black pepper, thyme and garlic cloves. Toss together and spread in an even layer skin side up. Roast for 30 minutes until lightly golden. Change to broil setting until internal temperature is 165°F and skin is deep golden brown. In a small sauce pan add panko and enough olive oil to just barely cover. Turn heat to medium-low and stir occasionally until golden brown. This step can take some time and creates very crispy breadcrumbs, don't increase heat or it will likely burn. Drain and transfer to a small bowl. Mix in ½ teaspoon salt and half of the lemon zest; set aside. When olive oil has cooled, set aside for future use or discard. In a large pot, bring water to a boil and season with salt. Cook pasta to al dente directions and reserve ¼ cup pasta water. Meanwhile, in large sauté pan over medium-low heat, render pancetta until most of the fat melts and meat is crispy, about 8 to 10 minutes. Add garlic and red pepper flakes; sauté until softened, about 3 to 4 minutes. Increase heat to medium-high, mix in lemon juice, remaining lemon zest, olives, parsley and season with black pepper; sauté until warmed through, about 2 to 3 minutes. Mix in cold butter until melted, it will create a silky sauce. Drain pasta directly into sauté pan and add just enough pasta water to create a sauce, toss together until warmed through. Garnish with crispy lemon breadcrumbs, flaky sea salt and parsley. Serve immediately. Curiosity got the best of me. I've been seeing cashew cream everywhere lately and really wanted to try it out. Let me tell you, it's pretty damn good. I'm sure it's a great dairy substitute, but I love it as is. It would be a great addition to any dessert or simply topped on a bowl of berries. Can I be honest? I might have eaten it straight out of the bowl by the spoonful, just like peanut butter, don't judge me. (I usually see this recipe made raw and vegan. My version isn't but try maple syrup if you'd like a vegan version). My version came about because I was raiding my pantry and after several trips this year I wanted to try out a few things I had collected. The honey and sea salt made by Jacobsen Salt Co. were a gift after a trip to Portland or PDX as they say. Instant fan of their stuff. My friend Emily Elyse Miller of Trends on Trends curated the coolest trip with Visit Portland. I can't wait to go back, it has a killer local makers community. In January, a trip to Zanzibar resulted in a suitcase loaded with spices including cinnamon. Who can resist those spice markets? By the way, we stayed at the most amazing private villa Casadamare, I'll let the photos speak for itself, trust me, just GO. It was the perfect retreat after climbing Mt Kilimanjaro. When styling the photos I reached for my friend and amazing local NYC artisan, Jono Pandolfi's white ceramic bowl. Such a beautiful simple and clean design. I gave the scene a little French twist with some pretty patterned ceramic bowls I bought in Arles, France. Much more on that trip another time, but special thanks to my friend Armand Arnal a local and Chef from Arles but also a co-owner of one of my favorite cafes Maman in NYC. He made visiting a little town in Provence so special including a heavenly lunch at his restaurant La Chassagnette. It turns out this 6 ingredient recipe takes me on a stroll through memory lane and around the world. I can't wait to travel again and see what I collect or get inspired by. Drain and rinse cashews; discard soaking liquid. Add cashews and 1/4 cup filtered water to Vitamix or high powered blender. Pulse until just barely incorporated. Add balance of ingredients. Blend on low and increase speed. Add more water until you reach desired consistency. Transfer to a bowl and keep in refrigerator until ready to serve. Serve chilled. Note: I like my sweets on the milder side, feel free to adjust the honey quantity to your taste. Coconut cake, probably my favorite cake. I doubled this cake recipe once and half the layers ended up tasting like churros. If I can figure out a way to duplicate that, I'll let you know. Try variations on this recipe using different sizes of cake and types of shredded coconut. See my mini version above. 1 ½ cups unsweetened large flaked coconut, toasted for flavor and a rustic look or untoasted for an elegant white cake. Cut 2 rounds of parchment paper to fit the base of each cake pan. Grease two 9-inch cake pans with room temperature butter, place a parchment round in each cake pan and grease the top of the parchment paper. Dust with flour and discard any excess. In a large mixing bowl, using a fork whisk together flour, salt and baking powder. In the bowl of a stand mixer fitted with the paddle attachment cream butter and sugar together until pale in color and fluffy, about 2 to 3 minutes. Add yolks 1 at a time until each is incorporated. Scrape down sides and bottom of bowl with a rubber spatula as needed. Lower speed and add flour mixture in 2 to 3 batches. Batter will be very thick. In a mixing bowl (I prefer a large Pyrex liquid measuring cup since it has a pour spout), whisk together cream of coconut, coconut milk, vanilla, orange zest and orange juice. Add coconut cream mixture and shredded coconut to the batter in 2 to 3 batches. Beat on low until just combined, do not overmix. Transfer to large mixing bowl used previously for flour. In the clean bowl of a stand mixer fitted with the whisk attachment, whip remaining 6 egg whites until soft peaks form. Gently fold into batter with a large rubber spatula. Divide batter between the prepared cake pans. Smooth batter using an off-set spatula. Bake for 50 to 60 minutes. Test for doneness by inserting a toothpick in the center of the cake, it should come out clean. Cool cake on wire rack. Unmold cakes once they are just cool enough to handle, about 15 to 20 minutes. If the cake is completely cooled it will be difficult to unmold. Using a serrated bread knife, place one hand on top of cake to hold it steady and cut each layer in half horizontally through the center of the cake into two layers. If cake layers are domed during baking, level cake by using the serrated knife. Those are the best parts of the cake to snack on! Cake should be completely cooled for several hours before frosting, or made the day before. If you make the cake in advance wrap each cooled cake tightly with plastic wrap before cutting into layers. Store in refrigerator for 2 to 3 days or freezer. In a large metal bowl whisk together sugar and egg whites until fully combined. Set bowl over a pot of boiling water as a double boiler, constantly whisk until the sugar has completely dissolved. Pour mixture in the bowl of a stand mixer fitted with a whisk attachment and whip on high speed until it is thick, shiny and white. The peaks should be very firm. If they are not firm, the frosting will not be stable. While the egg whites are whipping, sift confectioner’s sugar. After you reach stiff peaks, add confectioner’s sugar all at once into mixer on very low speed until it is fully incorporated. Add butter and shortening in 2 to 3 additions. Switch to paddle attachment and beat on high speed until smooth, approximately 5 minutes. The longer you beat the frosting, the whiter the color will become. The buttercream can be stored at room temperature for 4 days, up to 2 weeks in refrigerator, 2 months in the freezer. Add 1 small dollop of frosting in the center of a cake stand or plate. Optional to place cake onto a cardboard round available at any baking supply store or online. Place 1 of the 4 layers of cake, cut side up. Cut 5 strips of parchment paper cut 3-inches wide. Fan out each piece of parchment by tucking in the center of the paper under the cake while covering the cake stand. This will ensure easy cleanup of the cake stand after decoration. Spread a thin layer of frosting on top of the first layer of cake using an offset spatula. It's easiest by starting with a large dollop of frosting in the center and spread it out. Push enough frosting to the edge of the cake, it’s helpful if the frosting extends past the cake. This helps keep the layers even and aids in frosting the exterior. Sprinkle top with toasted coconut. Place next cake layer on top and repeat with frosting and coconut. Repeat with the third layer and for the final layer place cut side down (I prefer the bottom piece of the cake rounds as they are flat). Optional: For stability place a bamboo skewer into the center of the cake and trim to height of cake, it will be covered with frosting. Spread frosting in a thin layer on top since it will be covered in roses and 1/4-inch thickness of frosting on the sides of cake, otherwise you may run out of frosting while piping the rosettes. Transfer remaining frosting into a large pastry bag fitted with 1M pastry tip. Place a large 18-inch pastry bag in a pint class, fold back the sides and fill frosting using a rubber spatula. Unfold sides upwards and twist to create pressure. Pro-tip: To keep things tidy, use an icing bag tie to keep the bag closed. And while frosting the cake you can rest the pastry bag in the pint glass. Hold the pastry bag in your dominant hand and keep the bag firmly twisted, use your other hand to guide the base near the tip for control. Starting from the center of the rose, press the pastry bag at the top and guide the tip to move in an outward circle until the rose is created. Keep even pressure but as you approach the final edge of the rose, begin to lighten the pressure to create a tapered finish. Optional to make the roses uniform or varied in size. Remove parchment paper from the cake stand and any excess coconut flakes that have fallen during the decorating process. Pro-tip: When piping a new cake design, I practice frosting techniques on parchment paper. It’s easy to scoop up the frosting and re-use it while you're practicing your skills or planning a new design concept. Spring has finally arrived. But there is still a chill in the air. This is a good seasonal transition side dish to late Winter and early Spring menus. There brightness from the red wine vinegar and the crisp red onions give a nice tanginess and fresh texture. This is an ideal dish accompany your Easter dinner. Preheat oven to 450°F. Line a half sheet pan with parchment paper. Spread the brussels sprouts over the pan, drizzle with olive oil and season with 1 teaspoon salt and 1/2 teaspoon pepper. Mix well and roast for 10 minutes. Meanwhile, prepare quinoa according to package instructions. Drain any excess liquid. Add 2 tablespoons olive oil to quinoa and mix to coat evenly. In a large skillet over medium high heat, toast the quinoa until crispy. Use a wooden spoon to scrape the bottom of the pan if the quinoa begins to stick. Once the quinoa crisps, use the spoon to release the quinoa. Transfer to a large bowl. Return skillet to medium heat and add 2 tablespoons olive oil, red onion, garlic, 1/2 teaspoon salt and 1/4 teaspoon pepper. Sauté for 3 to 4 minutes. Whisk in vinegar and mustard. Keep warm until you are ready to serve. 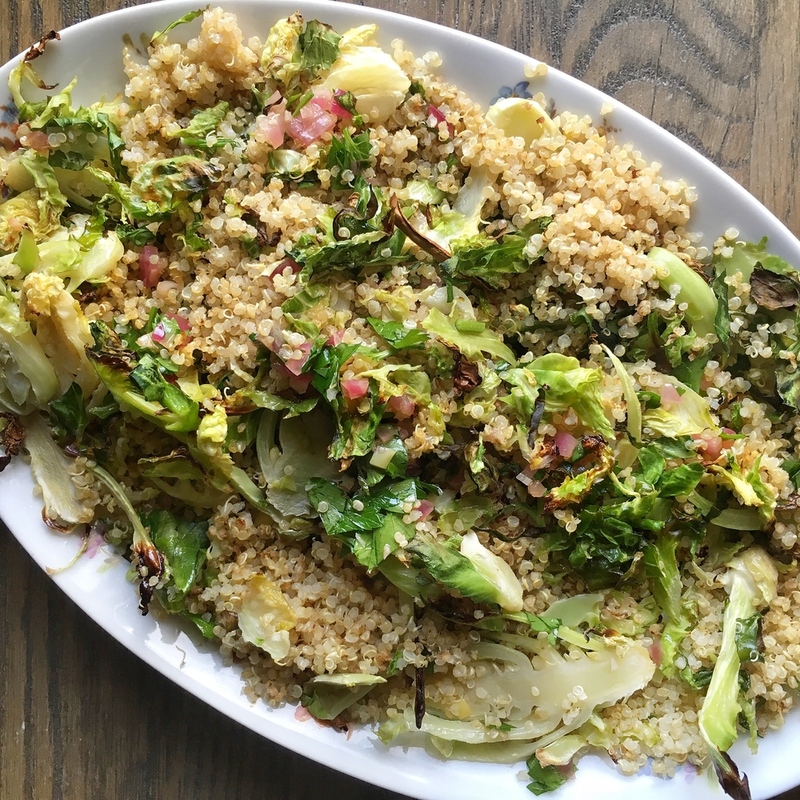 Add the parsley, brussels sprouts and vinaigrette to the bowl of quinoa. Mix well and serve. Adapted recipe from "Insanely Easy Weeknight Dinners" on Delish.com. Pretty sure I've never met a party dip that I didn't like, this is no exception. 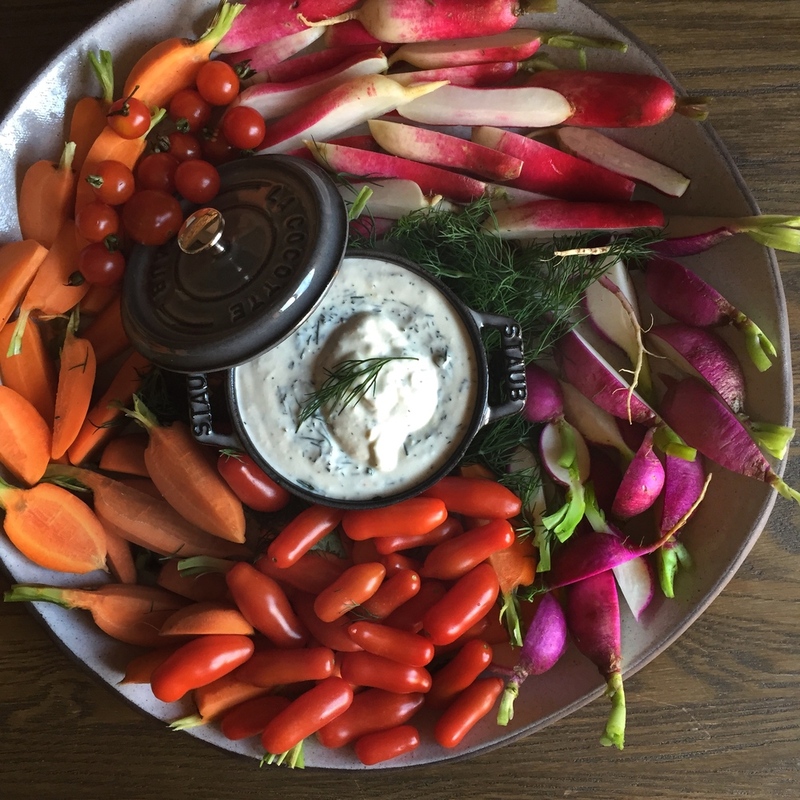 I make a version of this dip for almost every party I have. This is a great base that you change up easily by layering on additional flavors such as scallions, chives cayenne or even horseradish. Enjoy this for any gathering or holiday party full of friends and family. Excellent with seasonal vegetables from the farmers market. My all time favorites are carrots, fennel, a variety of radishes and those cute little baby cherry tomatoes when you can find them. It might be fun to make some baked root chips, but we all know potato chips will always be a winner. Below I make mention to microplane the garlic, a trick I learned from my friend Mark Bello, owner of Pizza a Casa (rockin' pizza school in NYC if you haven't tried it). It's a genius trick I've not been able to stop using. Particularly great in recipes when you don't cook the garlic since it is probably the finest you will ever get the garlic and it's a huge time saver. In a medium bowl, mix all ingredients together. If possible, make this a day ahead so that all the flavors have time to bloom. Suggest to add 1 teaspoon of French Vinaigrette herb mix from Penzeys Spices.